Pegasus is marked by "the Great Square of Pegasus", four stars in the horse's body that form a square whose sides are each over 10° (the width of one fist, held up to the sky) across. 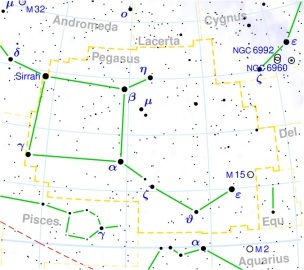 You can find the Square of Pegasus by following the line from the pointers of the Big Dipper through Polaris and then twice as far on Polaris' other side. One of the stars (Alpheratz) is actually over the boundary into the constellation Andromeda. The other three stars are in Pegasus. All are between 2nd and 3rd magnitude. There are no brighter stars in the square. Pegasus is home to a few faint galaxies and a Globular Cluster (M15). M15 is easy to see in binoculars though no detail can be seen. A telescope shows a little detail around the edges on a night with good visibility. You'll need to be pretty experienced at observing variables to spot the difference that Scheat displays, varying in brightness by just half a magnitude! Happy hunting.